At Chestnut House Nursery we offer an exciting environment that promotes free play and planned experiences that are designed to meet each child's interests and needs according to their level of development. Play is essential for a child's development, it builds their confidence as they learn to explore, think about problems and relate to others. Our practitioners will assist your child’s learning through careful, warm and positive involvement in their play. Through these experiences we aim for your child to begin to appreciate the joy of learning and finding out about the world around them. 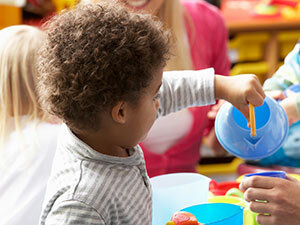 During your child’s time with us we will record their experiences in a “Learning Journey”. The Learning Journey is a keepsake that celebrates your child’s achievements, serves as a reminder of your child’s wonderful experiences and highlights your child’s discoveries as well as showing their progress through the EYFS. The children in our three to five year room take part in a high quality programme focusing on the prime areas of learning designed to promote language and sound awareness called Letters and Sounds. It builds on the activities the children have already experienced in the setting and at home to increase their phonic knowledge. We encourage the children to be responsible for meeting their own needs, for example, learning to dress themselves, serving their own food and handling their own personal hygiene. A thorough induction program enables practitioners to get to know your child and family well so that strong bonds are formed from the start. We like to involve parents in Nursery life and use the Learning Journeys and home link diaries for each child so we can learn about their home life. Each child is assigned a key person who co-ordinates information about individual children's needs and development and shares this with parents to maintain consistency and continuity of care. The key person will be someone your child grows to trust and who makes sure their needs are met and offers them reassurance.